The presentation of genital injuries and emergencies in pediatric girls can sometimes be misleading. 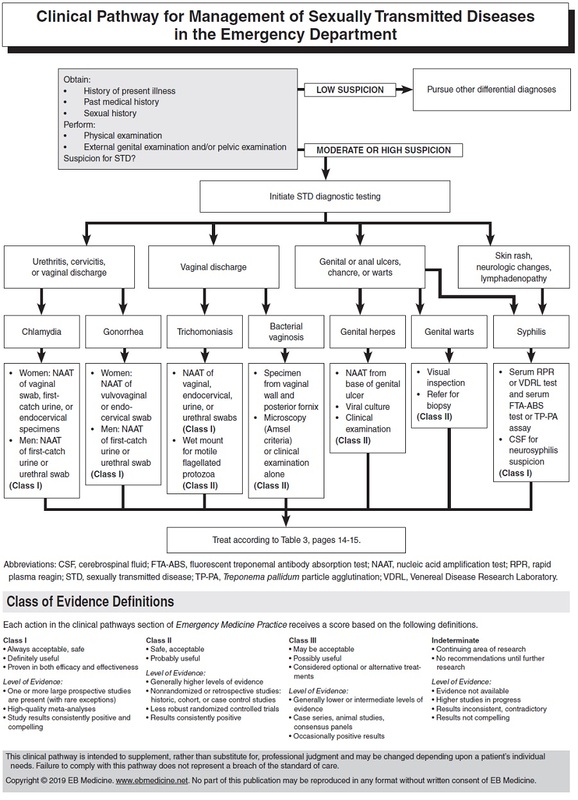 A traumatic injury with excessive bleeding may be a straddle injury that requires only conservative management, while a penetrating injury may have no recognizable signs or symptoms but require extensive surgery. 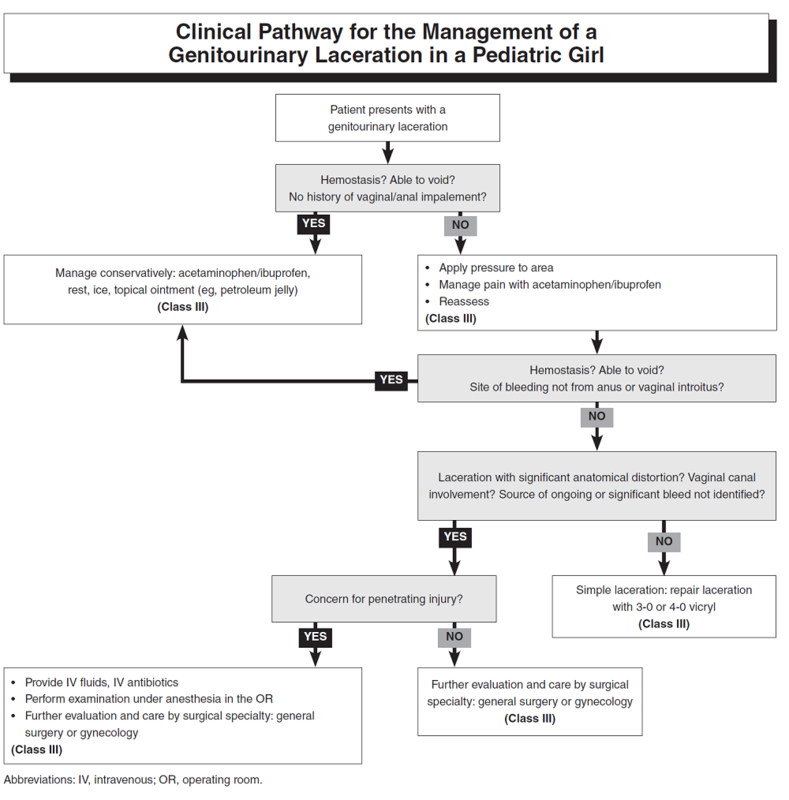 This clinical pathway will help you improve care in the management of a genitourinary laceration in a pediatric girl. Download now. A 15-year-old adolescent girl is brought into the ED by her mother for severe abdominal and pelvic pain with dysuria. The patient is otherwise healthy, with no significant past medical history. She is not sexually active and denies any trauma. Upon questioning, the patient states that she has had cyclical abdominal pain over the past year and a half, which typically lasts 2 to 3 days, and then self resolves. She has not yet started her menses. This is the first time that the pain has been 10/10 in severity, and she has new urinary urgency, with inability to fully empty her bladder. On physical examination, she is Tanner stage V for breast and pubic hair development, her abdomen is soft with no palpable mass, and she has no costovertebral angle tenderness. On visual inspection of her perineum, she is noted to have a large, bulging purplish mass in her vaginal area with a small leak of blood. Are there any laboratory tests that you should order? What imaging—if any—would be the best choice for confirming the diagnosis? Should you try to release the pressure and evacuate the blood? You obtained a urine sample from the 15-year-old girl to evaluate for pregnancy and a urinary tract infection simultaneously; the results of both were negative. You also ordered an abdominal ultrasound to assess the mass. The ultrasound showed a semisolid pelvic mass measuring about 15 x 10 x 10 cm, suggestive of hematocolpos, with a normal uterus and ovaries. Gynecology was consulted, and the patient was admitted for a hymenotomy. Congratulations to Kimia Kashkooli, Eva Soos-Kapusy, Kenneth Dowler, Dane O’Donnell, and Christopher Cruz — this month’s winners of the Pediatric Emergency Medicine Practice Audio Series Vol IV. Enter to win a free copy of Pediatric Emergency Medicine Practice Audio Vol IV, the latest in our audio series collection, by submitting your answer to the question above. To do so, simply enter your response in the comments box. A valid email address is required to enter. The deadline to enter is October 11, 2018.